Pictures can not do this dress justice. Three of Something dress. Samantha Wills bangles. Samantha Wills necklaces. Danielle Nicole bag (similar). Kelsi Dagger heels. This Three of Something dress isn't as assuming online as it is in person, but as soon I saw this in their latest collection, I just knew I had to put this in my closet NOW. It was that gut feeling, that woman's intuition, that told me this piece is special. And I hit the lottery when I realized I was right. Its luxurious weight and super soft cotton create its own breeze and deliver the most mesmerizing waves of fabric - so you don't walk, you glide. When I can, I'll try to post an instavideo showing how good this dress make it werk. Or you can trust me and snag this summer stunner right now. You seriously have such a sun kissed glow in all white outfits. The simple gold accessories only add to that natural radiance. Wow! That dress is amazing! 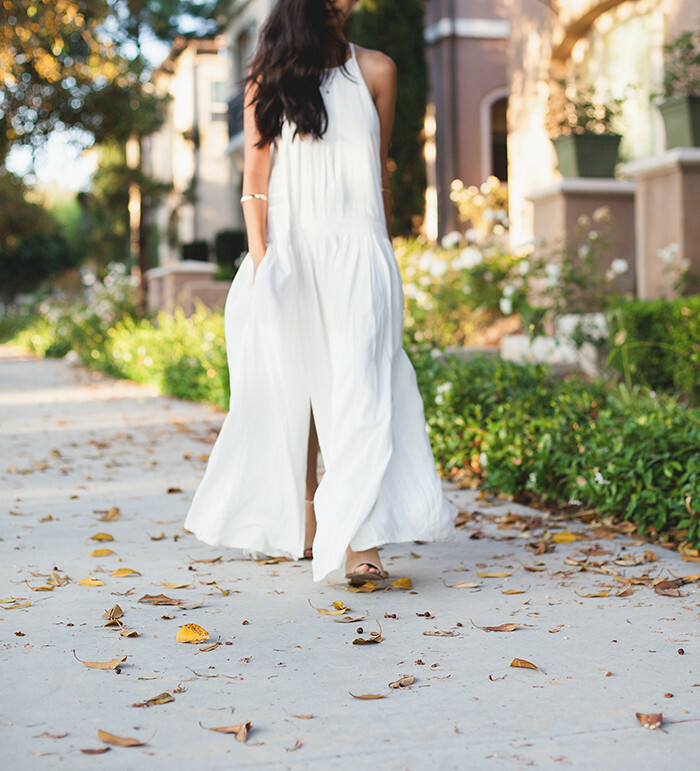 The perfect white maxi! I love that this has pockets, such a perfect summer piece ! I love the drop waist! You don't see that often. Gorgeous! Beautiful photos and stunning dress! that dress is so flowy and summery! That dress is stunning and you look great wearing it!